Français: Le triangle dramatique composé des trois parties concernées : les victimes, les persecuteurs et les sauveurs. To embed this file in your language (if available) use the lang parameter with the appropriate language code, e.g. [[File:Drama triangle.svg|lang=en]] for the English version. 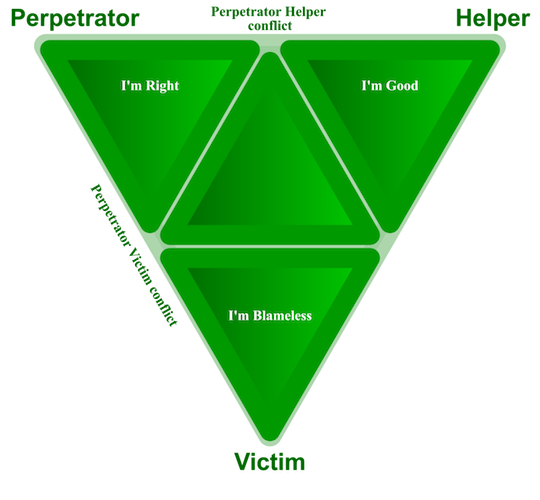 English: "The drama triangle composed of the three parties involved: victims, perpetrators and helpers. One alleged victim has a problem with an alleged perpetrator. A (self-proclaimed) helper gets involved, the offender feels attacked by the helper. is from the victim-offender conflict a helper conflict, where the offender to the victim and the rescuer becomes the perpetrator." Deutsch: "Das Dramadreieck besteht aus den drei Beteiligten: Opfer, Täter und Helfer. Ein vermeintliches Opfer hat mit einem vermeintlichen Täter ein Problem. Ein (selbsternannter) Helfer mischt sich ein, der Täter fühlt sich vom Helfer angegriffen. Aus dem Täter-Opfer-Konflikt wird ein Täter-Helfer-Konflikt, wobei der Täter zum Opfer und der Helfer zum Täter wird." Español: "El triángulo dramático compuesto por las tres partes implicadas: las víctimas, los perseguidores (agresor) y salvadores (socorristas o rescatadores). Una presunta víctima tiene un problema con un presunto agresor. Un (autoproclamado) salvador se involucra, el perseguidor se siente atacado por el salvador. De un conflicto entre víctimas y perseguidores se desarrollar un conflicto entre salvadores y perseguidores, cuando el perseguidor se convierte en la víctima y el salvador se convierte en el perseguidor."